2 304 stainless steel flanges, 1 stainless clamp. 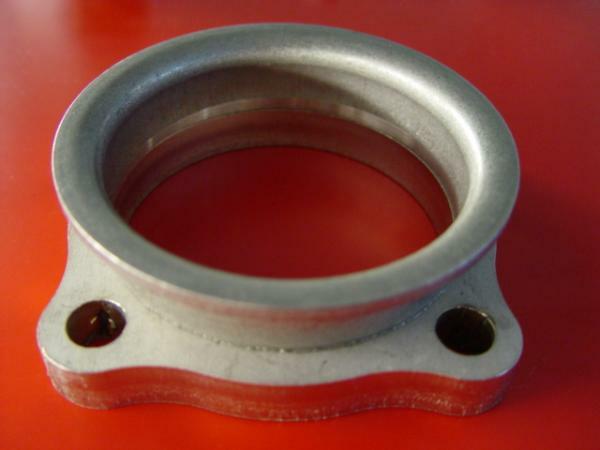 304 Stainless steel flange for KKK K-27 turbocharger exhaust side, 3 inch center hole. KKK K-27 turbocharger to V-band clamp adapter. For stock KKK K-27 turbo to use V-band clamp. Made with 304 stainless steel. For Tial GT-28R GT-30R GT-35R turbocharger, on Tial turbine housing it is with female side. connector. 50 mm on the side where flanges meet, 54.5 mm on the back of the flange. 76 mm OD made with 304 stainless steel. 42mm OD inlet, 51 mm OD outlet, 2 mm thick. 42mm OD inlet, 52.7 OD outlet, 2 mm thick.